Three words: Disgusting, disgraceful, dishonorable, is how I have to characterize how Donald Trump and his campaign treats those who serve, those who have served, and the families of military personnel. Ever since the parents of Army Captain Humayun Khan so eloquently spoke, and criticized Donald Trump at the Democratic National Convention there has been a full court press by Trump, his aides, and his most strident supporters to demonize the Khans in the most cruel, senseless, and even evil ways. What they have done and continue to do is so offensive that it drew the official rebuke of many veterans groups, including the Veterans of Foreign Wars, and the Iraq Afghanistan Veterans Association. Trump is the ultimate bully and crybaby. He went to Twitter to complain of their “vicious attacks,” of course ignoring how has made a career of not only making vicious, and even libelous attacks on people of all walks of life. But then, like I said he is a bully and a crybaby. His assault on military personnel and veterans knows no bounds. He went out of his way to insult, attack, and demonize the Khans, and some of his aides and advisers have insinuated that they are connected to the Islamic Brotherhood, and demanded that they condemn Islamic militants, like losing their son in the battle against them doesn’t count. He mocked John McCain who spent years in a North Vietnamese POW camp, as well as others who have been POWs. He equates his high school years at an elite military prep school as being better than having actually served in the military. He says that he knows more than Generals about how to defeat ISIL. He stated in his acceptance speech that the military was “a disaster.” This list could go on, but even more despicable is the fact that while he claims to “have made sacrifices” he used five deferments to dodge the draft, something that he seems proud of doing. The farcical comments by one of the head of his political action committee, that his sacrifice included losing two marriages because he was so committed to his business, conveniently leaving out the part about his constant affairs that led to the break up of those marriages. Some sacrifice. Why Trump acts this way might be a mystery to some, but I have a theory. Trump actually feels inferior to the men and women he is insulting because he knows that his avoidance of serving in Vietnam was cowardly. So he has to tear down McCain, he has to say he knows more than the generals, he has to go after the parents of a fallen hero. He is pathological in his need to prove his superiority, but as much as he blusters, Trump knows that he cannot live his own dishonor down, and so he must actively continue to belittle the sacrifices of, and even attempt to destroy the lives and reputations of those who actually did serve. 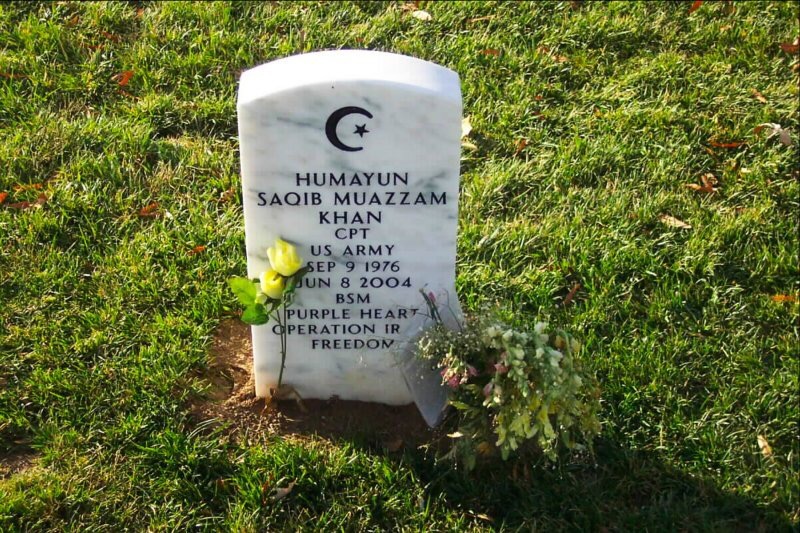 Truthfully, the man has no honor, and neither do his henchmen in the Christian Right who have been the loudest and most vicious critics of the Khans, simply because they are Muslim, and who have demeaned Captain Khan’s sacrifice to protect his troops from a terrorist car bomber. Some even said that he was not a hero. To see people who claim to be “Christians” act in such a manner defies the imagination and brings to mind the images of the burning of heretics, witch hunts, and more recently in American history the lynching of blacks by the supposed Christians of the Ku Klux Klan, the Red Shirts, and the White Leagues. But truthfully I am surprised at none of this. Many American Evangelical and Conservative Christians only care about the military and the men and women who serve in it so long as it fits their political and religious agenda, and they ruthlessly attack anyone who dares to criticize that agenda. I know this because it has happened to me on quite a few occasions. The whole affair has both sickened and angered me as a thirty five year veteran of the Army and Navy, as a combat veteran, and as a Christian. When I see the venomous nature of Trump, his campaign, and many of his supporters I fear for the country. A a Mike Pence speech the mother of a current Air Force member asked Pence about Trump’s attack on the Khans and was booed by the attendees, and he made no attempt to stop it. The campaign being waged by Trump reminds me of the 1932 campaign of Hitler against Paul Von Hindenburg. In that campaign war veterans of non-Nazi parties were attacked, derided, and sometimes murdered by Nazi Brownshirts. The violence of the Trump campaign language being used against the Khans and others who disagree with Trump could easily lead to physical violence against Trump’s enemies. Don’t say it can’t happen, violence was a central feature of Trump supporters during the primaries and as the election draws closer I would not be surprised to see an uptick in the number of acts of violence against those who oppose Trump. So anyway. That will be all. Have a great Tuesday. I knew that on the Democratic Convention there was a speaker, the parents of a fallen American soldier, a captain, who came to the USA. They worked hard. The only thing than makes a difference for Trump is that they ar Muslim; as so many Americans are. I listen to the speech of the father of captain Khan, and I got goosebumps hearing it. He, and his wife and his other suns have suffered a great los. As he was speaking I was thinking that those like Trump and his blind, deaf, ignorant, superficial, but very loudmouth followers would turn this into something ugly and suspicious. As they did! I have seen some answers of Trump or a discussion on Fox and what jumps out is the comments of Trump are no comments. They have no beginning, middle or end. He speaks a lot but doesn’t say anything of substance. As Trump attacked Senator McCain about is POW time Vietnam, he was so insulting; because it was not only what he said but the total lack of empathy to at least try to grasp something of the fear and pain the senator must have going through. You can endorse war or not, you can find the reasons for war right or wrong. But at least acknowledge those that were killed, those that suffered great hardship, saw men at its worst and best..
For years I see, hear and read Americans make comparisons with their society and Nazism. I have always strongly protested against this type of comparing. But I must admit that at the end of your post I do see the point you are making and I understand.